Heading North on a road trip to Ipswich (Qld) for the 2014 Australian Lure Expo and a post on web site lurelovers.com.au “What pub’s, places or faces should I visit on my trip North?” led to a tip “Don’t miss Les Barlow, lure maker, Stanthorpe, Qld”. This was enough info for me to search Les out and in doing so I discovered was a genuine living legend, especially within the Northern NSW and Southern Qld cottage lure making scene. After a fair yarn with Les on my first visit, I camped in town at Stanthorpe’s local waterway, Storm King Dam. That night I pondered how interesting it would be to go back and have a proper chat to Les with the intent of doing an interview / article for this magazine, Les obliged. Inviting me into his house, I felt privileged to have a great chin wag for an hour or two gaining an insight into his life, what makes him tick, to share his passion for the mighty Murray cod and spend time with him in general. We spoke about everything from his days as a local builder to his newly purchased final resting place with allot of fishing tales in between! Leslie Alwin Barlow, 82yo describes himself as a straight shooter, no BS and his word is gospel. Looking like a cross between Santa and a swaggie, Les is a gentle man you would be proud to call your father or a friend. 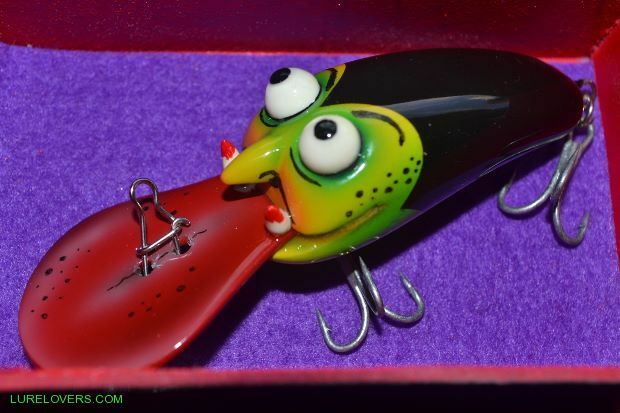 Les started making lures back in 1987 and in that time has made 1000’s. From his 14 different styles, his color patterns vary immensely. Initially he sold them from the side of the road and local markets but nowadays, the back shed of his McGregor Terrace, Stanthorpe home is his outlet. Les will be first to admit his paint jobs aren't flashy but he prides himself on their fish catching ability. Rex Hunt once said to him “You make a good lure young Barlow but you’re a rough painter”. 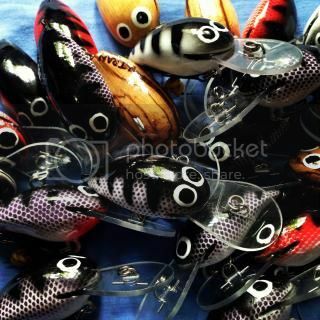 Les’s simple reply - “Fish aren't art critics!” Every lure that leaves Les’s shed is signed “Les Barlow Lures, the model name, $5.00 and Stanthorpe”. An interesting point to note is that every lure he sells is for a mere $5.00, the main reason being so that kids can afford them and go fishing. Les’s pet hate is people who “load up” and buy multiple numbers of his lures with the intent of making money off them instantly either via e-bay or on selling them. Taking into account time spent making, painting and hardware costs (hooks, split rings & bibs) he should be selling them for allot more but that’s not what he's is about. Les says they are made to be used. Over time the biggest Cod reported on one of Les’s lures has been 56lb while his personal best stretched the scales out to 32lb. Asked how long he'll keep going for? He smiled and said “As long as the fingers keep hanging in there”! As mentioned, to purchase Les’s lures in bulk would be an insult unless you had full intent on using them to fish. I was guilty of buying 5. To me I purchased a piece of fishing history and a talking piece. 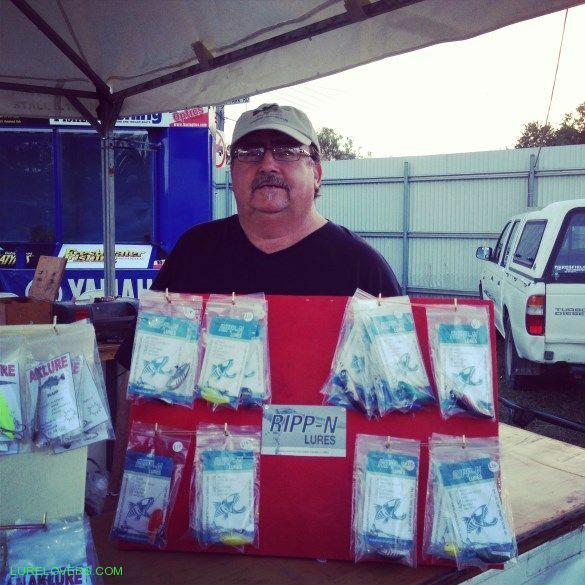 These lures now sit proudly amongst a lure display in store at Lake Mulwala Fish Camp & Ski with some of the finest painted and most highly collectable lure in the land. The “Les Barlow’s” have their own unique story to tell. A couple of other answers and statements Les offered up – Favorite freshwater fishing spot is around Ballandean Qld, loves having visitors and knows nothing about computers! If you’re ever in Stanthorpe, be sure to look Les up, call in and buy a couple and have a chat about all things fishing. I’m sure you will go away richer for the experience. As a Victorian with a genuine interest for all things that relate to Murray Cod, especially lures and the history of them, it amazes me how few "cottage" lure makers we have in this part of the world. Our numbers pale into insignificance compared to the "New England" and "Granite Belt" areas of northern NSW and southern Qld. There may be many tinkering in their back shed down this part of the world but it is time their amazing creations are brought to light. If you know of any lure craftsmen that have an interesting story to tell please let me know and Ill endeavor to get more recognition for their hard work as I'm sure they also have an interesting story to tell. Definition - "Cottage Lure Maker". Somebody that doesn't mass produce their lures, predominantly hand made timber lures produced from a small workshop, shed or lounge room! Great insight and thank you..
You are absolutely spot on about "only touching the edges" with this piece. To go into detail painting a picture of Les as a person and his lures would require a fair novel. I put it to him that I would run this past him after putting pen to paper but he said"No need, Ill trust you". Hopefully I have done him some justice. Interestingly I came across a great piece / interview done by Dave Magner that was published in QFM late 2012 when I did a Google search. Excuse my ignorance but who do you write for? Personally I don't get to excited about doing feature articles but have been doing the local reports for the Lake Mulwala region for the last 15yrs through various form of media. Good read tony....les is a special bloke. Theres quite a few pics and similiar stories in the les barlow section on here. Great post Tony, Les is an awesome bloke, great character, very old school wish there were more people like him, he has given a lot to anyone who likes to fish. Decided to give him something special(lure) for his 80th Birthday, he called me the day he received it and said he would take it to his grave with him.....I'm very honoured. All good information witch seems to tell the same positive story about an "Aussie Icon"
That is a top read.I am catching up with Les tomorrow for the first time I can not wait to meet him, Have a chat and grab a couple of his lures.. He sounds Like a top bloke on the phone. I didn't know that Les existed, when I lived at Tenterfield - 1989 to 1996. There were so many people making lures, in the area, it was near impossible to know everyone. The Severn River, near Ballandean, was one of my favourite fishing locations. Les sounds like a bit of a character and it would be great to catch up with him one day. Thanks for putting this story together. He is full of surprises the old bugger - and always stirring me up - a true Aussie character with a true Aussie sense of humour. When I was there he actually pulled out several "special" lures to show me and I distinctively remember his showing off your's. Well done. You wouldn't believe it but I have your lure hanging right next to Les's in my shop display. We would do well to have more Les Barlows in the world! So that's where he was. I went around yesterday but couldn't raise him. He was probably too sore to get up. Ive only ever spoken to Les on the phone, A top bloke full of yarns and full of beans for someone not so well. A real genuine man, One i hope to meet. Yeah Mick - I was there about 7 am then tried again at about 2:30 pm. He must have been resting.